The exponential growth of digital connectivity, devices and information is driving profound changes in the way we work, all around all the world. In order to survive in this world, companies need to rethink everything from culture to tools and environments. There is a lot of talk about how the workplace is changing; it is certainly a very different place from even 10 years ago. We hear about how the emerging Gig Economy means there is no longer a job for life, and how digitization is effecting the workplace in many different ways. Rethinking everything includes rethinking the way we enable and support learning in an organisation. The world of business is moving very fast nowadays so it is becoming increasingly difficult for a L&D department to keep their people up to date, and as people are moving in and out of jobs there is a need to think about how L&D can support a contingent workforce. It is therefore becoming clear that what is needed are employees who take responsibility for driving their own continuous development, that is employees who think about what skills they need to develop, both now and in the future. In fact, for forward-looking organisations, continuous learning lies at the very centre of their company culture. Some companies now recruit for “learnability” – the desire and ability to constantly learn new things. In fact a key pillar of Google’s recruitment strategy is to hire “learning animals”. From my own research I can see that the learning habits of individuals who exhibit high learnability are already changing. They no longer rely on being trained by their company or taking online courses to move forward, but rather they recognise that they learn in many different ways for and at work. This might come from their daily work experiences, from interactions with their customers or colleagues or from their manager or even working with a coach or mentor. But it also might come from interactions with people in their professional networks and online communities (from thought leaders to practitioners), from participation in professional events (both in person and online), from receiving a continual drip feed of knowledge in the form of blogs, articles and other news, as well as accessing and making use of a wide variety of resources on the Web. I call this new way of learning for and at work – Modern Professional Learning. 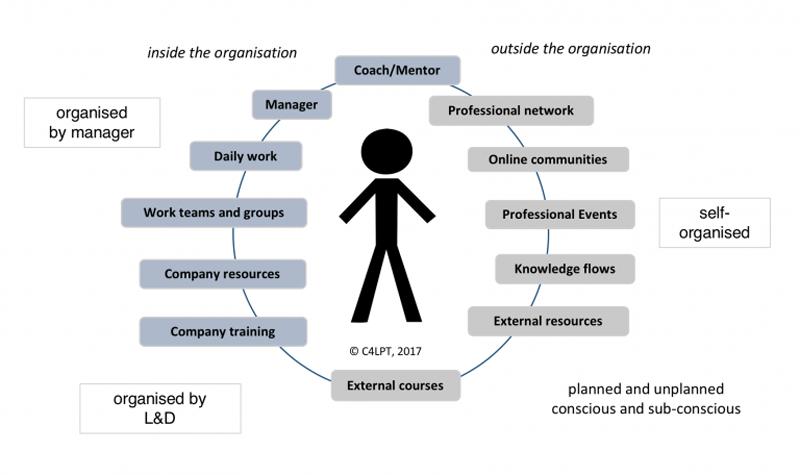 What is more, Modern Professional Learning happens both inside and outside the organisation, through both planned and unplanned activities, and is both a conscious and sub-conscious process. It is partly organised by L&D, partly by managers, and partly self-organised. Modern Professional Learning occurs both inside and outside of the organisation. In the modern workplace, it really isn’t appropriate to use the LMS to try and track everything everyone learns in the organisation. In fact trying to do so is neither practicable nor feasible. A new and much better approach is to have the employee organise and manage his or her own learning. But what about the technology that underpins learning in the modern workplace? Currently the prime technology that is in place is the LMS which is used to track employee (online) training. But in the modern workplace, it really isn’t appropriate to use the LMS to try and track everything everyone learns in the organisation. In fact trying to do so is neither practicable nor feasible. A new and much better approach is to have the employee organise and manage his or her own learning and where the manager measures success – not in terms of “learning activity” (whether it be attendance on training, completion of courses, or posts and comments in social platforms) but in terms of changes in job, team or business performance. 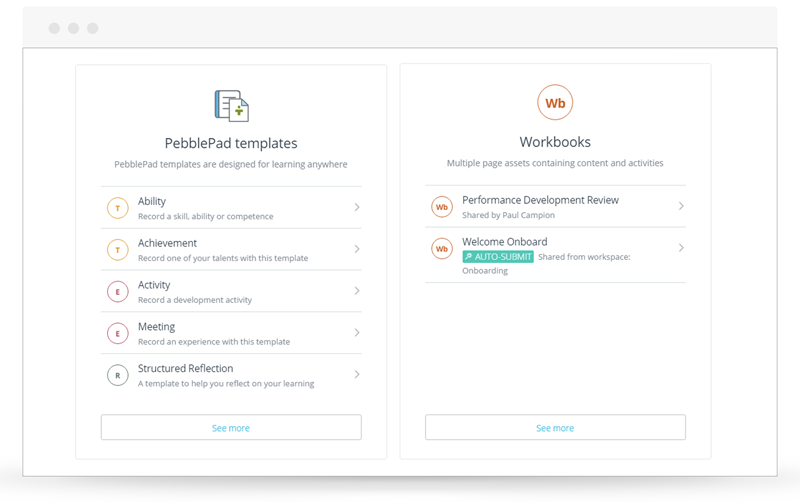 This is where PebblePad comes in as it offers the individual the ability to set up a privately controlled Personal Learning Space, and provides a set of templates to support their learning in a number of ways, e.g. a SMART Action Plan for setting professional goals, and a structured reflection template for recording and reflecting on experiences (wherever and however they take place – in the classroom, online, in the office, in a conference, or elsewhere). 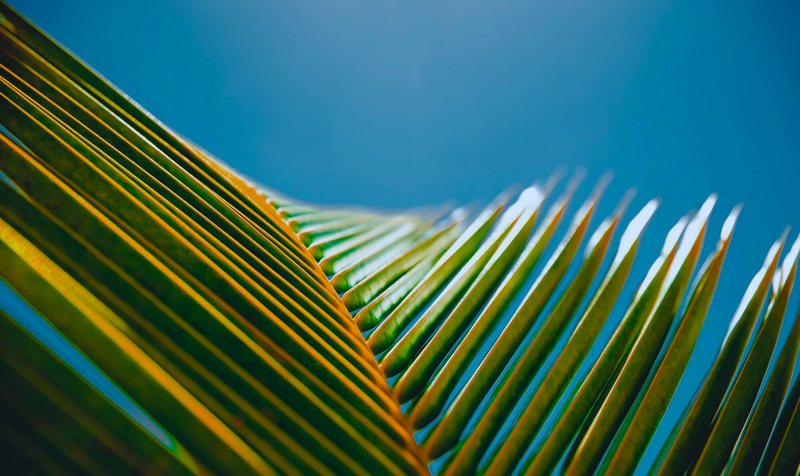 These templates also mean that individuals can then spend more time thinking about what happened and what they learned, rather than how to craft a coherent reflection or record on a blank page. digital workbooks for specific purposes and contexts. There is also a mobile app, PebblePocket, which makes it very easy for individuals to use the templates or take photos or videos, on the go, to record their experiences or provide visual evidence of new performance. Furthermore, every asset that an individual creates is, by default, private to them, but they can, if they wish, share anything with one or more people privately or publicly (on the Web). The individual can also decide whether viewers can leave comments or feedback on their resources. Whilst an individual might adopt PebblePad for their own personal use, there is a strong case for an organisational implementation. In which case a company might create an institutional space (ATLAS) where workspaces can be set up (by both L&D and managers), where content can be pushed down to employees , and where individuals might (more formally) submit their assets for feedback, peer review or validation, e.g. for performance review, promotion or professional accreditation. Another space (Flourish) might also be set up to support coaching and mentoring in the organisation. Modern Professional Learning in a PebblePad context. 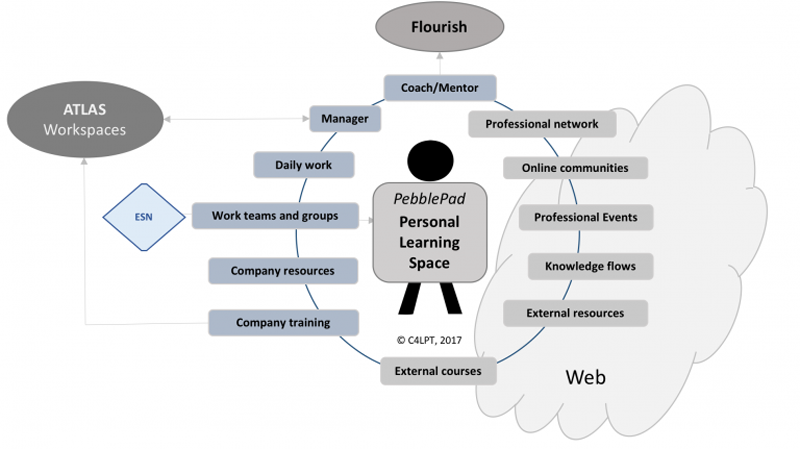 Using PebblePad to provide a new organizational framework for workplace learning brings a number of advantages. 1. It would send a clear message about the importance of continuous learning to the business. 2. It would put the individual’s Personal Learning Space firmly at the heart of organisational learning and would also help to ensure that learning is integrated from beyond the workplace. 3. It would move the focus away from tracking “learning activity” (by L&D) to tracking real performance changes (by managers). All this is game-changing – and that’s not a term I use lightly or very often – both for the organisation and for the individual. Since the individual’s Personal Learning Space is portable and can be detached from one organisation and re-attached to another, this means everyone wins. An individual can continue to build on their professional learning as he/she moves from job to job, and the organisation can benefit from the wealth of experience new and current employees bring to the table. PebblePad is not a new product; it has been in use in some of the world’s best universities for over 12 years now, and the Founders are themselves experienced learning professionals. But now it is also being used in organisations who recognise the need for a new technology framework to underpin the multitude of ways employees learn in the modern workplace. PebblePad is thrilled to be exhibiting and speaking at Learning Technologies 2017. If you&apos;re heading to LT17, you&apos;ll find the friendly PebblePad team on Stand R6 (where you can signup for a free trial, see PebblePad in action, and grab the chance to win an iPad Mini). You&apos;ll also be able to catch PebblePad Commander in Chief Shane Sutherland teaming up with Jane, author of this blog post, discussing modern workplace learning and how to support it. You&apos;ll find more information on the seminars below. Anyone wanting to learn more about why today&apos;s modern workforce requires a very different approach to learning and a very different kind of technology to support it. Not attending LT17 but want to be kept in the loop? 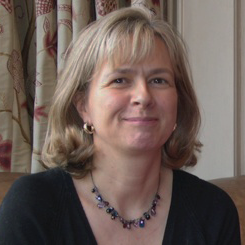 If you are not going to be at Learning Technologies 17 but you are keen to learn more about Jane&apos;s work and what we do here at PebblePad, then simply subscribe to our blog and we&apos;ll update you on what you missed at LT17 and make sure you get the heads-up on future events and developments.